Google have introduced a new featire that will enable commuters to view the auto-rickshaw routes as well as the estimated fares on Google Maps app. The feature is now available for Delhi and is currently available only on Android devices. The new feature will reflect fares based on the official fare model shared by the Delhi Traffic Police. "The feature will also help the users plan their journey better, so they could look at the expected cost of the auto-rickshaw ride and decide whether they want to take it all the way, or perhaps take a different mode of transport instead," explained Vishal Dutta, Product Manager, Google Maps. Google, however, did not inform whether the feature, currently available in Google Maps app for Android devices, will be rolled out to other cities in the near future. To use the feature, update Google Maps to the latest version. Open the app, search for a destination, then tap on directions and go to the public transport tab. Commuters will be able to see the autorickshaw result in the "Also Consider" section. After choosing the mode of transport (auto-rickshaw icon) on the screen, you can see the estimated price of the journey and the route's traffic information. Then tap ‘Navigate' to start the trip. 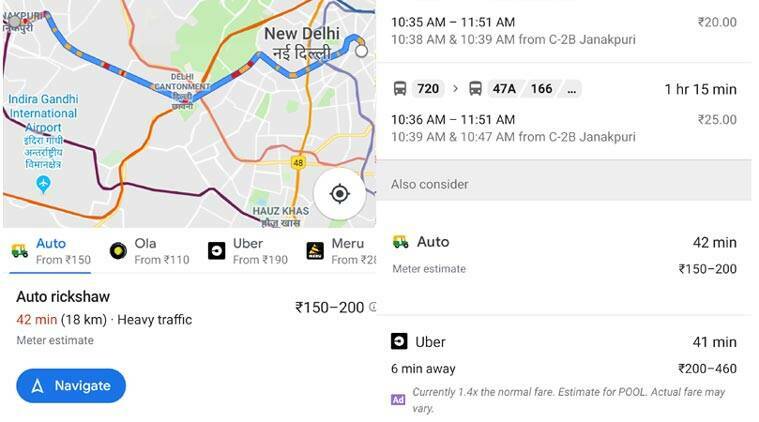 The same option can also be accessed via the "cab" mode on Google Maps, said the company.